Shelter beds are available tonight at Oakland's year-round shelter, St. Vincent de Paul in West Oakland, located at 675 23rd Street, as well as well as at the Crossroads Shelter in East Oakland, located at 7515 International Blvd. For unsheltered residents looking for an indoor reprieve from the unhealthy, smoke-laden air, tomorrow, Sunday, St. Vincent de Paul will once again open its doors all day from 9:30 am – 3:00 pm as a drop-in respite center. The Main Library, located at 125 14th Street, is also scheduled to be open tomorrow from 1 to 5 pm. This afternoon we distributed all 1,400 N95 masks generously donated by Euge Lee and Western Gravel and Roofing Supply. If we receive more masks, we will make them available next week. The City Administrator's Office has N95 masks available at our front counter, located in City Hall, 1 Frank H. Ogawa Plaza, 3rd floor. Our office is open until 5 pm today. We will also send masks to Health Care for the Homeless for distribution to our unsheltered residents. Visit their website at www.ACHCH.org for more information and resources. Thank you to Vice Mayor Annie Campbell Washington for receiving a donation of 1,400+ masks from the generous Oaklander Euge Lee and Western Gravel and Roofing Supply! 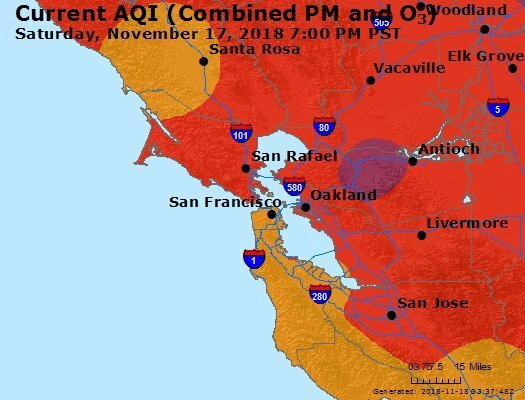 Our hearts go out to the victims and families of the Camp Fire in Butte County, which continues to burn, and the impacts are being felt across the region as air quality has worsened, fluctuating between “unhealthy” and “very unhealthy.” As of 10 am, the Air Quality Index is in the “very unhealthy” range. Impacts are most severe to our most vulnerable neighbors: infants and children, the elderly, pregnant women, those with respiratory or cardiac issues, and our unsheltered. Oakland’s libraries, senior centers, and other City facilities remain open as options for the public to come indoors. The City’s Head Start centers and recreation centers/programs are closed today due to very unhealthy air quality and recommendations from public health experts. The best option for everyone, especially children, the elderly, and persons with chronic lung or heart disease, is to stay indoors with windows and doors closed and avoid prolonged outdoor activities. Some specific masks (N95s or higher), if properly fitted, may be helpful for those who must be outdoors for prolonged periods. N95 masks require a tight seal to work, thus are not protective for men with beards or young children. Persons with chronic lung or heart disease or other medical conditions, should check with their healthcare provider before using an N95 mask, as they can make breathing more difficult. Bandanas (wet or dry), paper or surgical masks, or tissues held over the mouth and nose will not protect from wildfire smoke or small particulate matter in the air. “The Bay Area is continuing to experience heavy smoke from the Camp Fire in Butte County. Air quality continues to be unhealthy through much of the region and these conditions are expected to persist through Tuesday at least. While weather conditions will vary somewhat in the coming days, air quality is expected to remain unhealthy because there is so much smoke trapped at the surface and surrounding the region. Check the Air Quality Index for up-to-date air quality information. Monitor local air quality conditions and indicators to stay indoors, by visiting www.airnow.gov. Sign up to receive local emergency alerts via text, phone, and/or email. See this Wildfire Resources webpage and this posted flyer for more details and guidance from the Alameda County Public Health Department.